Statins, the most commonly prescribed cholesterol-lowering drugs may have adverse side effects on your brain. Research suggests that statin users often report symptoms like fuzzy-headedness, memory loss, forgetfulness and confusion; when they are on said medication. Your body needs some cholesterol, but high levels of low-density lipoprotein (LDL) i.e. “bad cholesterol” can block your blood vessels and put you at high risk of heart diseases such as heart attack or stroke. However, to identify your risk for heart disease, the more beneficial test is to measure LDL particle size. Only small LDL molecules are dangerous, as they stick on the artery walls, causing inflammation and plaque formation. 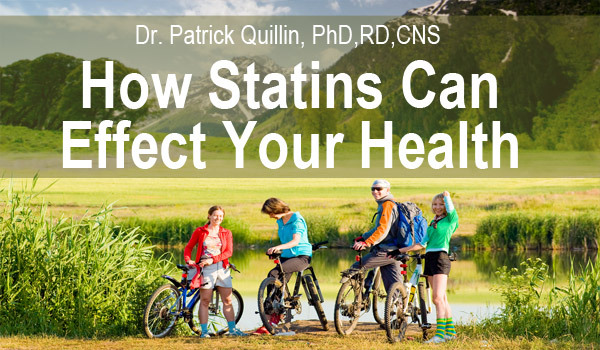 What Statins Do Inside Your Body? When you have high cholesterol or a higher risk of heart disease, doctor prescribes statins to block the production of cholesterol or even reduce the amount that is built up in your artery walls over the years. The problem with statin drugs is that they address the cholesterol issue in a simplistic manner, by blocking the enzyme HMG-CoA reductase in your liver, which is needed to produce cholesterol, hormones, memory proteins and maintain cell energy. The drug essentially reduces your total cholesterol number, without addressing specifically your high-density lipoproteins (HDL), low-density lipoproteins (LDL), very low-density lipoproteins (VLDL) or triglyceride levels. This impairs various bodily functions such as to build new cell walls, in formation of vitamin D and in production of hormones, where your body needs cholesterol. In recent years, due to persistent direct-to-consumer advertising campaigns, statins have been accepted by people (especially over 45 years of age) as the primary prevention of heart attacks and strokes. However, indiscriminate use of statins can have harmful, covert side effects. In 2012, the US Food and Drug Administration (FDA) announced additional warning labels for statins. One of the warnings by FDA is that statins may increase the risk of memory loss and confusion. This came as a result of anecdotal reports compiled from many statin users, who experienced symptoms of brain dysfunstion i.e. memory loss, confusion, brain fog, difficulty concentrating, paranoia, disorientation, depression and dementia. Besides, impairing your working and recognition memory, certain statins may even lead to transient global amnesia and other types of cognitive damage. Some animal studies reveal that rats on statin had impaired learning, with lower abilities to form new memories and recall information, required to perform simple learning and memory tasks. A quarter of the body’s cholesterol is found inside your head. Besides, being an integral part of every brain cell, it is found in the myelin sheaths that insulate the neurons. Cholesterol is also required for the formation of synapses and production of neurotransmitters i.e. the chemicals that brain cells use to communicate with each other. Therefore, scientists believe that cholesterol lowering drugs like statins may damage your brain by creating a cholesterol deficiency. Some excellent food choices to help protect your brain. Insufficient cholesterol not only inhibit production of neurotransmitters but also other important bio-chemicals like coenzyme Q10 and dolichols, which can impair your cognitive function, emotion and mood. Often deficiency of these chemicals results in serious memory loss but some people report other side effects like getting very depressed, anxious, or even suicidal when taking these drugs. However, in general these symptoms were found reversible as the problem vanished shortly after stopping these medications. While statins users often report memory loss, one research study found that 48% of women who take these medications eventually develop diabetes which also greatly increases your risk for dementia. Sometimes combining multiple types of medications can also lead to adverse reactions, including confusion or memory loss. Adverse effects are dose-dependent, and your health risks can be amplified by a number of factors, such as taking other drugs (which may increase statin potency), metabolic syndrome or thyroid disease. Some of the consequences of taking statin drugs in strong doses or for a long period of time include: headache, difficulty sleeping, drowsiness, high blood sugar (type 2 diabetes), loss of consciousness, cognitive loss, neuropathy and others. Finally, statins may be effective in lowering cholesterol levels, but they may be causing more damage than good, with their possible risks. However, statins are profitable and out-sell all other class of drugs in the market, so doctors and pharmaceutical companies may have a vested interest in continuing to promote these drugs. This particular food can help improve your health in many ways. Limit simple carbohydrates, especially sugar and fructose, besides spiking your insulin level and triggering cholesterol development, simple sugars are highly inflammatory, promote plaque formation and increase stress hormones. Avoid harmful vegetable oils and trans fats as these increase bad cholesterol, decrease good cholesterol and increase inflammation. Eat heart healthy fats like nuts, seeds, olive oil, coconut, coconut oil, and avocado. Get omega-3 essential fatty acids from walnuts, flaxseeds and fish. Optimize your vitamin D levels by 20-30 minutes of direct sun exposure every day. It helps normalize your cholesterol levels and prevent heart disease. Are You Getting Enough Vitamin D? Lead a physically active lifestyle by staying active (i.e. stand up at work and get as much walk as possible) throughout the day. Exercise regularly and include strength training and high intensity exercises. Manage physical and emotional stress, as this increases blood pressure i.e. the pressure on your artery walls. Take out time for relaxation exercises (deep breathing, yoga, meditation and massages) to de-stress every day. Schedule 7-8 hours of uninterrupted sleep for repair, rejuvenation and optimal functioning of your body. Sleep deprivation increases stress in your body, which triggers high blood pressure, impaired blood glucose control and increased inflammation. ← Why is Serotonin So Important?